When I would visit my friend Neal Evans’s house as a teenager, it was always full of his mother Lee’s presence. This included artistic vigour, lots of projects, and a strong dose of social activism in the air. Lee and her husband Sam led the youth group at the United Church where my father was the minister. Although it was very uncool to be attending a youth group at a church that was, unfortunately, across the street from my high school, Lee and Sam actually made it fun and relevant. One time, we were involved in a project to raise funds for Mozambique, a poor, distant African country that was embroiled in a civil war of independence from its Portuguese colonizers. Our project – Lee’s idea – was to make soap and sell it. I wasn’t sure why we chose Mozambique, or soap, but Lee led the charge. I’d never made soap before, and I’m not sure Lee had either, but soon we were rendering large quantities of beef fat in the Evans’ electric oven, making a huge mess of their kitchen and possibly risking a house fire. Next, the process involved some toxic lye, pouring the resulting mixture into a baking dish, then cutting it up (like making brownies), and finally packaging it in papers labels we’d made by hand, with an African motif drawing by Lee. I think we sold the soap to our neighbours and friends, or maybe at the church. I’m not sure how much money we made, or if its impact was felt in Mozambique. But that wasn’t the point, I know now. It was really about us, I suspect, a little bit of consciousness-raising for teenagers. It was a weird project, but strangely cool. Whenever I visited Neal’s house there were always things like that on the go. In their large basement rec room there was a piano, a loom, a potter’s wheel and any number of other painting or craft ventures. There was no TV that I can recall. Beyond the rec room was the garage, which had woodworking machines mixed in with the family car, a pale green Land Rover, an original model with a manual transmission and a rock-hard suspension. When Neal and I started a hard rock band, we hauled our gear around in the Land Rover of course, and the Evans house was a frequent rehearsal space. When we decided to record a soundtrack for an audio-visual show we produced, the Evans living room was our studio, using gear that Sam provided. It was that kind of household: open, interested, creative and welcoming. It was also green and health foodie, almost before the terms were invented. There were bicycles, a compost pile, and Lee’s short-cut “Peasant Bread” recipe, which required no kneeding, the thick seedy loaves rising right in their baking pans. I didn’t have much complaint about my own home, but it was a lot more uptight than the looser, messier, more down-to-earth and engaged Evans abode. I liked being there. It’s also where I learned to drink myriad cups strong tea, a useful adaptation I could apply later, when I met my English wife. In our final year of high school, Neal, I and another friend wanted to escape the boredom and cliqueiness of school lunch hour. So we established a “lunch club”, which meant simply that three days of the week we walked to each other’s homes, where our mothers cooked for us. All three mums loved the idea, and with ravenous male teenager appetites, so did we. We suspected our mothers were competing to outdo each other with elaborate menus, which they only had to prepare once a week after all. We had just an hour, and that included a brisk 15–20 minute walk each way from school. We once devoured a massive casserole that Lee had made us for lunch, washed down with some sort of fruit dessert. We had to run back to school, getting stomach cramps along the way, and then had to fight an overwhelming urge to sleep in the afternoon French class. How geeky: going home to our mothers’ houses for lunch in Grade 12. We didn’t care. And I even think some of our friends envied us. There was a reason for Lee’s interest in Mozambique, I realized much later. She was born Fanny Lee Howard in Montgomery, Alabama in 1930, and carried that gentle accent with her for the rest of her life. She left the south in her early 20s to escape a rigidly class- and race-stratified society. She was only a few years younger than Harper Lee, the author of “To Kill a Mockingbird”, who grew up not far away from Fanny Lee, 100 miles to the south in Monroeville. They had the same religious upbringing in the Methodist Church, and they also overlapped studies at the same religious college in Montgomery (Lee studied Art and Theology). Harper Lee’s mother was also named Fanny, no relation. But while Harper Lee ended up as a writer in New York, Fanny Lee went as a Christian missionary to Brazil, where she learned Portuguese and met her husband Sam Evans, another emigrant, he an electrical engineer from England. There, she worked in the favelas of Rio de Janeiro – the city’s huge slums that we’re hearing a lot about this week as the Olympics take place nearby – teaching Art and English to children. It must have felt a million miles from southern Alabama. Neal told me recently, after I wrote him about Harper Lee’s death last February, that he had just read her second novel, “Go Set a Watchman”, which was published in 2015 to poor reviews and amidst a lot of speculation about how it surfaced after languishing for decades – almost as a first draft of the acclaimed “Mockingbird”. He said he preferred “Watchman” because its open, casual racism more closely resembled the Alabama he visited as a child. Fanny Lee Evans influenced me as a teenager out of all proportion to my relationship with her. She was simply the mother of my high school best friend Neal. At that age, your friend’s parents weren’t normally people you cared very much about, nor spent any time with. But Lee was an ever-sympathetic ear, both then, and later when I’d return home to visit my parents. I loved the car tour we took of Lee and Nelllie’s childhood haunts outside Mobile and along the Gulf Shores, near where Nellie lives, all the while listening to the sisters telling stories in their Alabama drawl. Although I knew that Lee came to despise many of the things that the U.S. stood for, both domestically and internationally, her love for the place she grew up in was pretty obvious. So why did my sister in Vancouver respond by text with the comment “The end of an era!” when I wrote to tell her that Lee had died earlier this week? I think it was because of our family’s close relationship with the Evans. It was a friendship that enveloped both adults and kids, and with connections that endured through many decades. If we’d lived in England, I probably would have called her “Auntie Lee” and her husband “Uncle Sam”. Ten years ago, when my own mother was dying in Ladner, B.C., Lee visited the Delta hospital where we were keeping watch over her. She was there the night Mum died, and led my sisters and I in a prayer in the darkness of mum’s room, then helped us straighten Mum’s body, brush her hair, and prepare her for cremation. I think that’s what my sister meant by, “the end of an era” – the passing of friends that are deeply involved in your family, and whose parents feel a little bit like your own when they go. Lee Evans with her daughters Peggy and Carol (either side of her), grandson Wylie, son Neal and son-in-law Bob (behind her), son-in-law Bryn in front. 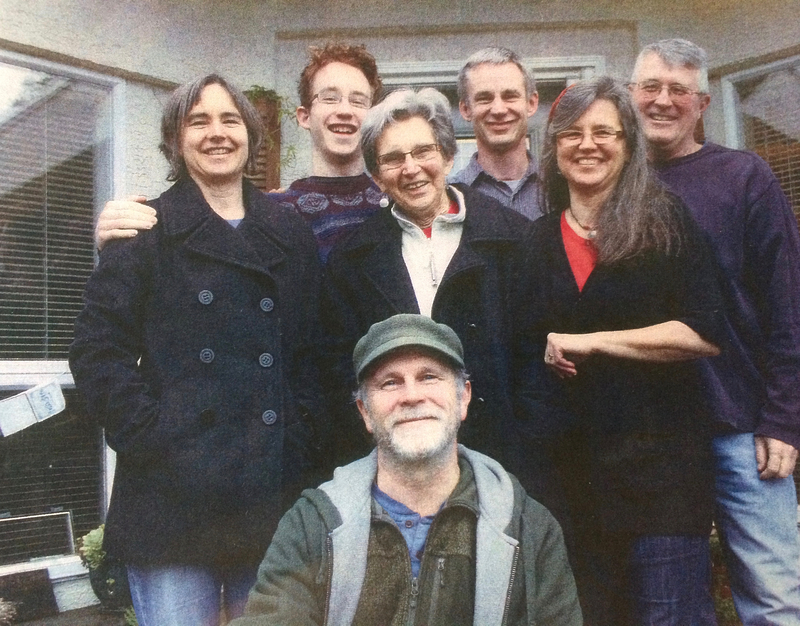 Missing: daughter-in-law Peg Evans (I suspect she took the photo), plus three grandchildren – Max, Frank and Natalie. Lee Evans died late Monday afternoon at her home on Saltspring Island. She was 86. She practiced as a Baha’i in her later life after Sam died, converting eight years ago. She suffered with Parkinson’s for her last years, and lived a full year beyond what the medical experts expected, a period of considerable trial for her and her children. But, amazingly, she had all three of her offspring and their spouses with her on Monday. Together they sang “All Through the Night” as they sensed her breath failing, then one of her favourite hymns, “All Things Bright and Beautiful” and finally, a rousing round of “Seek Ye First” when her life finally, mercifully, ceased. I have never in the 40 + yrs with Mama Lee been referred to as Native girl….